We are very pleased with the tv console. The green finish and antiquing look very nice in person. There was a small scratch on top that I wasn't sure if it was intentional as part of the antiquing process. In any event it didn't bother us enough to contact overstock about it. This piece came before expected Yeah! It is absolutely gorgeous, very well built, plug ins for the entertainment center that we did not read about. Bonus! I'll be looking for other pieces to purchase from them in the future. We purchase the berry color perfect subtle red. I purchased this tv console in antique white and couldn't be happier! The color works well against our light grey walls and dark wood floors. It is a beautiful, sturdy piece of furniture and the built in power strips are great for hiding our cable box and wireless router. We just love this piece! It is made so well. The inside of the drawers are lined with velvet like material. Each side of the shelves has a power strip! This is a beautiful media console, sturdy and well made, good quality - a definite "get what you pay for" piece. The drawers are felt-lined (a touch of luxury right there) and operate smoothly. While not deep vertically, they hold a lot horizontally. The pre-drilled holes in back for cords and the pre-installed power strips were real pluses making component installation easier. I bought the berry color for a pop of color and it's perfect. Not red-red, more like blackened red. It's a beautiful color. I paid the $9.99 to have the item delivered inside my home (thank God! ), but I didn't pay for "white glove" service which means setting up. I was a bit shocked when the deliverers left me with this 201 lb 6-foot box of cardboard. But my son and daughter-in-law had no trouble removing the cardboard and foam from around the console and taking the packing outside for recycling. Then they moved the console in place for me. An added plus: this piece went on sale a couple of days after I ordered it; and when I contacted Overstock about that, the rep graciously credited my account for the difference. We have only 7 days for that courtesy, so be vigilant. I recommend this media console. I love this piece! This is solid wood construction, and looks like an antique table! It works great with my classic colonial decor! The color is beautiful and the best part is, it comes fully assembled! With white glove delivery, it couldn't get any better!! I have received lots of compliments! This console table is exactly what I was looking for. I wanted grey, 70" long, and traditional square glass doors. As others have noted, it's good quality for what it is. I'll always be a fan of vintage, solid-wood furniture, but it wasn't practical with this. The drawers are dove-tail joined, and velvet lined. The electrical outlets inside are a nice feature. My only minor gripe is that the doors don't line up as well as they should. But it's preassembled (major bonus!) and we paid the extra $ for overstock delivery guys to take it into the room we wanted - which was well worth it! Very nice solid cabinet. Comes all in one piece. You will love it! 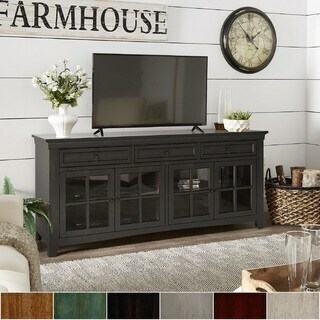 This is a nice media console cabinet. The built-in power strip is an extra bonus! It's a very sturdy cabinet and it's evident by the weight of it. The color is nice and so are the lined drawers. Definitely gives a feel of a quality product. Using it as my dining room buffet. Perfect color moss green. Goes really well with my farmhouse style of the house. Also got matching color chairs for my kitchen island. Great quality. Came with a little damage to the side. Cannot notice because how it’s placed in the room. Love it! When used a TV console this is a very large unit.If you choose to have it delivered to the outside of your home, you definitely need 2-3 strong people to move it, especially up stairs. Once you have it in place, it comes fully assembled and only requires unboxing. The color is as displayed in the photo and the console is very attractive. We love this piece. It helps anchor or room and the construction is solid. We like the soft-close drawers, too. The outlets and usb inside help us keep cords organized. We Love this! We use it in our family room for a media console. Looks great under our TV. Exactly what we wanted to go with our farmhouse decor. I bought this 3 drawer center console and it fits perfectly. I love it!!! I've been looking for something like this for month. Well recommended. I LOVE this console table!!! Great quality!! A very nice piece for my Living Room! I've had so many wonderful complements on it. Absolutely gorgeous! So happy with the look and quality. Beautiful cabinet in an unusual green color. Fabulous with our yellow walls. such a nice change from brown wood. Excellent customer service when one door was damaged: they shipped us a new one! While the piece was what we ordered the customer service was not good. The piece came damaged in the back. This was not from shipping as the box was completely intact- it had to come this way from the manufacturer. I filed a complaint and they said they would replace the unit or provide a $70 credit. I told them that shipping alone for this piece and a new one would be more than $70 and to have someone come out to repair the piece would also be more than $70. I told them I would settle on $100 which I still think is too low. No response since 7/22. I am not one to leave reviews but since Overstock asked here it is. Very disappointed. This customer was entered into a sweepstakes after submitting their honest review. It looks even better in-person. We got the red which is a deep color. It is very spacious and comes delivered as one unit so no assembly required! Such a deal!